[Q20] What are the current international agreements, treaties, conventions, etc., governing the use of space, and what specific limitations and constraints are placed on space operations? Author | Editor: Bragg, B. (NSI, Inc). 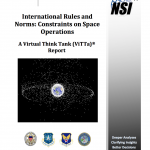 The expert contributors identified 26 separate international agreements, treaties, and resolutions (legal codes) that have implications for space operations (Figure 1). The core of the legal space regime is composed of five UN-sponsored space treaties3 centering around the 1967 Treaty on Principles Governing the Activities of States in the Exploration and Use of Outer Space, including the Moon and Other Celestial Bodies (OST). Subsequent non-binding resolutions, and the ITU Treaty, reflect the evolving nature of space operations, and the perceived need for legal codes to develop in response. Not all the legal codes that have implications for space operations are specific to space, however. UN general treaties, in particular regimes governing the use of force by states and the right to self-defense, inform space-specific legal codes. Furthermore, Article III of the OST states that all activities in space must be carried out “in accordance with international law, including the Charter of the United Nations, in the interest of maintaining international peace and security” (Steer). Multilateral and bilateral security agreements (NTBT, START I, New START) place restrictions on the placement, testing, and use of weapons in space by signatory states, and efforts are underway through the UN to prevent all states placing weapons in space. Some experts also argue that the laws of armed conflict (LOAC) are applicable to space operations (Hitchens; Kasku-Jackson; Steer). Figure 2 provides a timeline of all legal codes identified by the expert contributors, and any identified constraints they discussed. Full details of all legal codes and links to the documents are provided in Table 1. The majority of the constraints identified (21 of 40) deal with the placement, testing, or use of weapons in space, which are present in eight of the legal codes. The remaining constraints and limitations identified are, for the most part, not focused on placing prohibiting or limiting specific activities. 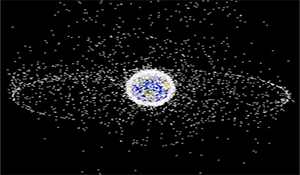 Rather, they are designed to regulate and reduce interference in the activities of others, create accountability and transparency in space activities, and encourage compliance with international law. One exception to this is the 1978 Convention on the Prohibition of Military or Any Other Hostile Use of Environmental Modification Techniques (ENMOD), which Dr. Cassandra Steer of Women in International Security-Canada suggests could provide a legal basis for prohibiting the use of kinetic ASATs. Overall, the expert contributors do not view the existing legal regime in space to be overly burdensome or restrictive. Starting from the basic tenets of international law—sovereign equality, non-interference, prohibition on the use of force, right of self-defense, peaceful dispute resolution—it explicitly applies these to activities in space (Steer). The emphasis on accountability, transparency (Blount), and coordination of activities reflect the underlying principles of the OST.